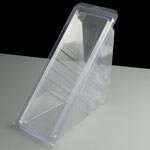 A range of plastic hinged sandwich wedges along with plastic baguette and tortilla packaging. 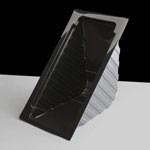 A range of plastic open sandwich wedges along with the machines and film to seal them. 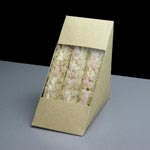 A range of biodegradable sandwich wedges and packaging including baguette and tortilla packaging. 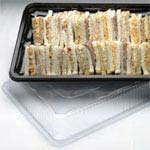 A range of plastic and cardboard sandwich platter bases and lids, ideal for buffet and party caterers. 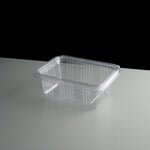 We offer a range of leakproof plastic hinged lid rectangular salad containers in a variety of different sizes. 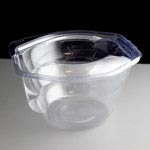 We offer a range of bowls and lids with the unique "Press and Dress" feature ideal of a wide assortment of cold foods. 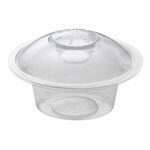 Hinge Salad Bowls and containers - 100% leakproof, from 250cc to 2000cc capacities. Some have space in the lid for a mini fork too. 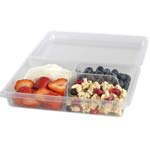 Great for displaying cold food like pasta salad, a regular salad or a fruit salad. Olivine Bowls with press & dress lids - Stackable cold food bowls with a separate sauce pot which clips into the lid. Ideal for mixing by the customer! 375ml, 500ml & 750ml bowls available. Perfect for serving a salad and a dressing. Sandwich packaging comes in many different varieties depending on how you wish to present your sandwiches, we have different sizes and style of wedge for off the shelf sandwiches and platters for buffets and working lunches. 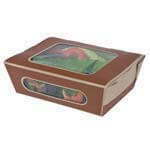 Biodegradable sandwich and salad packaging is also available, some of which is from the "Freshly Made Today" range, a bio tortilla wrap container, bio baguette boxes and trays and a bio salad box.